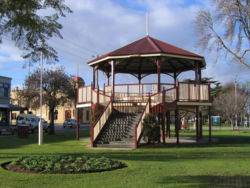 Bairnsdale, established in 1842, is the commercial and administrative centre of East Gippsland and the western gateway to the Lakes and Wilderness region of Victoria. It developed rapidly after the discovery of gold nearby in the 1860s and its place in goldrush history is evident in an historic streetscape. Bairnsdale, on the banks of the Mitchell River, is approximately 3 hours drive east of Melbourne on the Princes Highway and provides easy access to the Victorian snow fields of Dinner Plain and Mount Hotham and to the Alpine National Park via the Great Alpine Road. 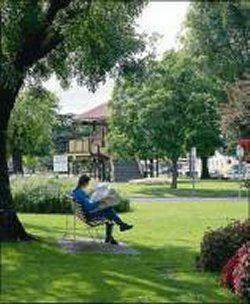 Bairnsdale’s main street is a duel carriageway with well-maintained gardens and parkland running through its centre. Relax by the rotunda and absorb the country atmosphere in Main Streets award-winning gardens which are a mass of colour throughout the year. The Court House - in Nicholson Street was built in 1893 and is now classified by the National Trust. 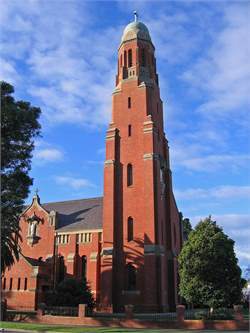 Its unique architectural design of gables, towers, chimneys and exquisite carvings of Australian fauna (for outside viewing only) catches the eye of visitors and locals alike. 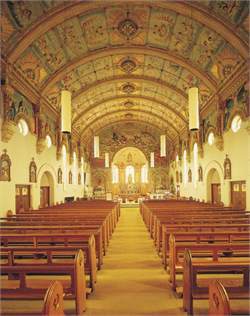 Saint Marys Catholic Church - in Main Street was built in 1913 and its hand-painted ceilings were completed by one man during the depression years of the early 1930s. The Canoe Tree - on the banks of the river was used by the indigenous people over 170 years ago for bark for their canoes. The Krowathunkooloong Aboriginal Keeping Place and Museum in Dalmahoy Street tells the story of the local Gunai/Kurnai peoples culture. Paynsville - 18km south of Bairnsdale - is the boating capital of Victoria. Raymond Island - Catch the ferry from Paynsville for some Koala spotting and good walks. Mitchell River - The Mitchell River winds through Bairnsdale before entering Lake King where it forms the famous Mitchell River Silt Jetties. These silt jetties stretch for 8 kilometres into Lake King and are second only to the Mississippi Silt Jetties. Just 2 kilometres from Bairnsdale, the Mitchell River flows past a wildlife reserve, Macleod Morass, on its way to the Gippsland Lakes. Inhabiting this freshwater marsh are over 130 species of waterbirds; catch a glimpse of them as you stroll along the boardwalk. Mitchell River National Park - 40km NW of Bairnsdale - Best accessed via Lindenow (C601), Canoeing and rafting are popular activities on the Mitchell River, but this Park is best known for the lush temperate rainforest of the Woolshed Creek Gorge and the Den of Nargun. The gorges steep walls provide protection from the heat and drying winds. The amphitheatre gives very good views of the Gorge. Buchan Caves- are famous for its spectacular limestone caves. Guided tours are conducted daily in both Royal Cave and Fairy Cave. Fairy Cave, discovered by Frank Moon in 1907, features elaborate stalactites and stalagmites. Royal Cave, discovered in 1910 by Frederick Wilson and opened to the public in 1913, features exquisite calcite-rimmed pools. Both caves are lit and have concrete pathways but are generally inaccessible to people with a disability because of the cramped and sometimes steep paths with many steps.